DUAL HEATING SYSTEM: Built using two independent, infrared heating elements, providing more consistency and uniform heating from root to ends. 1" CERAMIC, FLOATING PLATES: Deliver consistent heat distribution and an ultra-smooth glide, while enabling a long-lasting performance. Floating plate design ensures constant contact with the hair from any angle to reduce snagging. 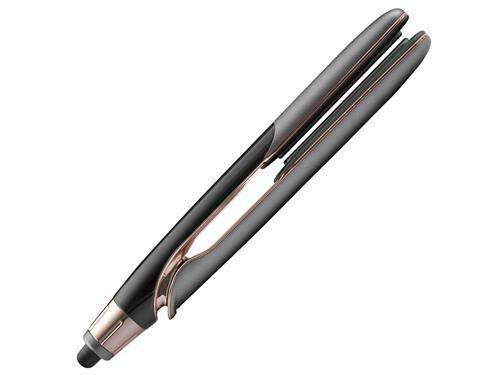 MEMORY FUNCTION: Uses smart memory functionality for more efficient styling at your personalized settings—every time you use the styler, it will automatically adjust to the last temperature setting used. 5 HEAT SETTINGS: Adjustable temperatures from 300-450°F for a variety of hair types and styling options. LED DISPLAY: Convenient, easy-to-read display notifies you of the temperature setting. AUTO SHUT-OFF: Automatically turns off the device after 60 minutes for convenient, worry-free use. VARIETY OF STYLING OPTIONS: Plate size and style enable a variety of styling options, from wavy curls to sleek and straight. LUXURY SWIVEL CORD: Extra-long, pro-length cord reinforced with fabric allows for flexibility in styling anywhere.